For independent authors, launch parties are fun, but online and social media launch parties can be much more effective at getting the word out—especially when you team up with other authors. To throw a social media launch party, you need a social media presence: a Facebook page, a Twitter account, etc. Much like a real-world party, you need to pick a date and time and advertise it, spreading the word as widely as possible, preferably at least a week in advance. 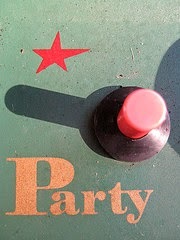 I put a note about the party in my blog tour for the book the week before the party. I've found that places where you can have lots of interactions on the same page, like Facebook (through a page or an event) and possibly Goodreads (in a group or forum), seem to have the best response. It's easier for the organizers to see all the interaction at a glance, and it provides more and more social proof, encouraging others to join in. Plus, the more people who join in, the more likely they'll be to add or share the event to even more people, either purposefully or through their newsfeed. 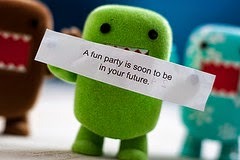 You can create the event in advance and invite friends to begin generating interest. Before the event, you might post sneak peeks of the giveaways, the approximate schedule, and more. On the day of the event, hosts (you or you and other authors) post at the Facebook event, Twitter hashtag or Goodreads forum. You might post excerpts from the book, trivia, teasers, giveaways, etc. You might ask book club-type discussion questions. Photos are especially popular. Balancing giveaways with tidbits about your book helps to keep interest in both. With my two-person party, we also promoted one another's books, sharing our favorite things about them, or sharing photos of one another's writing process. It's easier to talk someone else's work up than your own! Whether you're doing this by yourself or with partners, be sure to prepare your materials in advance. You don't want to be scrambling for a trivia factoid every 15 or 60 minutes. Of course, you don't have to wait for a launch to party! You can organize them around an event, a sale, a season, a holiday, a theme, anything. You don't have to throw a launch party by yourself! I've participated in a Facebook/Twitter launch with an author friend also premiering her latest book. We had so much fun! This week, I also participated in a Facebook event with about a dozen authors. For the larger event, one host made a spreadsheet with time slots. Each of the hosts signed up for an hour to act as "emcee," as well as pledging a giveaway for her hour, contributing money to a large grand prize basket, and taking on other responsibilities like creating graphics, coordinating the grand prize and organizing the Facebook event. Generally speaking, giveaways are the biggest draw of online launch parties. So, what are you giving away? You might be tempted to give away your new release, and that's fine, but I would advise you to not make that part of the big giveaway (unless it's as a box set perhaps). People may be tempted to wait to see if they won the book rather than buying it. Instead, you might give away swag (bookmarks, T-shirts, pens, pins, etc. ), treats (gift baskets), items related to your book (food/candy mentioned in your book, a trinket that is significant to your character, souvenirs from a setting, etc. ), jewelry, gift certificates, previous books in the series or others' books. For larger prizes, readers' prize packs—featuring ereader cases, treats, cozy blankets, reading lights, etc.—are often popular. Themed prize packs are good, too. I put together a "mini spy kit" to go along with my book, featuring items that could be useful in your every day life as well as serve a spy. Finally, ereaders were once quite popular as grand prizes, but they've become prevalent enough that it may actually decrease the number of entries. Of course, all that requires a budget. If you don't have a budget, your author friends might be able to help. Many authors will gladly donate ecopies of their books because it increases their exposure and marketing as well. You might also be able to have friends donate other items, from swag to jewelry to candy. The prize donors will likely help spread the word about your party, too, especially if you give them an idea of when you'll be giving away their prize! Keep in mind that sales may be a a secondary goal of a launch party. The biggest direct impact is getting your name, and hopefully your book, in front of more people. They may not buy your book that day, but at least they've seen it and they have a reason to remember it. Lowering your price for the party can be effective as well. When you mention the sale in your party, be sure to mention that it's for a limited time, and the regular price. What are your best tips for an online launch party, as a host or a participant? Working with other authors is a great idea! Thanks for these tips. I have to admit I've gone off the idea of having a social media party for my third book. I did them for my first two, using Twitter primarily, and even set up a live stream reading by webcame for each one. For my first one I had about 12 people attending. For my second it was only about 4, and in both cases it was people who'd already bought or ordered the book. It seemed like a lot of investment of time for little to no return. I was probably doing a lot wrong but I'm not sure how to make one work better.